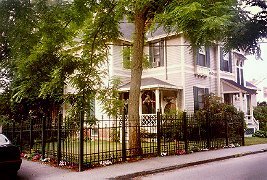 The Old Beach Inn is a Victorian Bed and Breakfast, built in 1879 and listed on the Rhode Island Historic Register. The seven guest rooms (5 in the main house and 2 in the carriage house: all non-smoking) are named after flowers and decorated with touches of romance and whimsy. All have private baths and many have working fireplaces. A generous continental buffet breakfast (on Sundays a baked entree is included as well) is served in the dining room or on the patio in warmer weather. The gardens, porches, gazebo and lily pond provide an inviting atmosphere in which to relax outside. Newport is famous for its mansions and several are within walking distance. The inn is very centrally located and the historic harborfront area is just a 7 minute walk away; beaches are also close by. Off-street parking is provided to guests. Rates range from $95-215 (rooms) and $225-325 (suites) depending on season.